Five orphans. A broken–hearted seamstress. East Texas. Halloween night. A man arrives–“a bad man with a very black heart”–bearing a box with five locks. He carries with him a handmade sword that can slice through anything it touches and an even more baroque story about its provenance. These are the basics of Mark Z. Danielewski’s The Fifty Year Sword, frequently described as an “adult ghost story” — which it is. It’s also a complex piece of experimental fiction that’s narrated in multiple overlapping voices, laid out like a poem, and embellished with abstract, almost fractal drawings. The novella was originally published in a small print run in 2005. 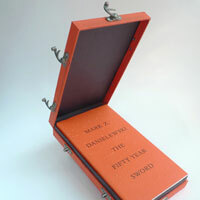 Today (October 16), Pantheon Books re-released the novella in a new hardcover edition, and next month (November 13) they’ll release a deluxe edition in a custom crafted orange box. 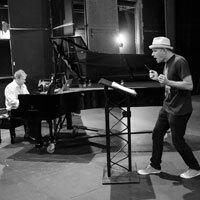 The past two Halloweens, Danielewski has staged an interpretive performance of Fifty Year Sword at REDCAT, bringing the story to life with actors and shadow projections. This Halloween, he’ll be accompanied by classical pianist Christopher O’Riley as he performs Fifty Year Sword for the final time. I’ve heard several origin myths about the book. One is that the Fifty Year Sword is about a weapon having a mid-life crisis. I like that. It’s a qubit for me because it lives in two zones. I was already starting to play around with the word games that were far more formalized in Only Revolutions and exploring a different kind of voice that wasn’t my voice but definitely wasn’t the voice of the cast and crew of House of Leaves. It was midway between the two books. The whimsy that preceded Only Revolutions and the whimsy that was permitted following Only Revolutions came back into my life. In some ways this is connected to The Familiar. It’s looking more closely at how image and text relate. It’s walking this barbed wire with bare feet between two much image and too much text. There’s really no such thing as “too much image” or “too much text,” but there is a liminal space between both where imagination lights up in a slightly different way. Finishing Fifty Year Sword was really about creating images that were coherent and intrinsic to what was textually stated and yet didn’t go so far as to deprive anyone of an imaginative leap. The heroine is a seamstress, so it was important to use thread and to create blank pages that give your imagination a certain moment to pause and consider. It liberated me in terms of language and voice. What’s gained by unstitching the words and sewing them back together into something that resembles a poem? The simple answer is that it’s a story told by five nameless narrators. Except for a hint in the handle to the story, we don’t know who they are except by the color of their quotation marks. We know there are five of them and there are five orphans. We’ve also been warned that this thing may have been stitched together in an entirely alternate way: The story we’re hearing may not be the story at all. So we get this caricature of violence and forgiveness. Maybe the story is far more complicated and dull but the compression of all that information is ultimately more impactful. When we read ghost stories as children, the frequent mode is, “This is what really happened.” This is kind of the opposite: None of this may be true. Essentially this is a very simple ghost story. I am grateful for your compliment that it’s a simple ghost story. None of it may have happened yet it may have as much consequence as if it did. We’re getting into Wallace Stevens territory. What these aesthetics of fiction reveal is that everything is a fiction. Our impression of a relationship, a breakfast, of the most quotidian event to the most dramatic one are fictions that interpose themselves between the raw stream of reality and the feeble mechanics that we have behind our eyes to process that. What interests me — and defines in some ways — my artistic pursuit is how to characterize or “caricaturize” info in a way that is obtainable, reachable, and motile enough for a reader to apprehend quickly and usefully. As simple as this ghost story is, take one step further and you’ll see how complicated it is. I can see why Michael Robbins’ Alien vs. Predator is one of your favorite books of the year. There are similarities in the wordplay and the way you both structure the lines. There was just such kinetic energy there and as much as there’s a delight in playing with the here and now you can still feel the knowledge of Stevens, Donne, Rilke, not to mention many minor poets who I can’t track. It’s been a long time since I’ve read a book of poems with that recurrent vitality. This novella feels like it’s meant to be read out loud or performed. I know you’ve said that other works of yours will never become movies, but have you, perhaps without intending to, written an experimental screenplay? I think it’s too small to be a screenplay. It’s a tiny story in some ways, but what resonates with me about your question is that the typography, the layout, the illustrative elements felt very much like they were realizing the text, like the text was incomplete without those elements. This final process of bringing to life both the hardcover and the eBook was very much like filming a screenplay. It was like making a movie. There was a certain element of production. I had to depend on others, their wits, their whiles, their creative elements. And that team kept expanding. It becomes a sea of people, many of whom you’ll never meet. This book certainly felt like that more than any other. That kind of hearkens to the notion of the phatic conversation. House of Leaves remediates movies. Only Revolutions remediates music. The Familiar remediates a television series. Whether people like or dislike the book, that move toward remediating music was very therapeutic for me. The sound of language can be just as important as all the syllabic particulars that it contains. People can use all sorts of misnomers, malapropisms, and broken grammatical phrases and yet still communicate their sensibilities, their ideas, their passions, and their disgusts. I’d spent so much time after college formally investigating etymologies of words that I became locked down by the grid of language. The world around me was potent with the music of communication that wasn’t entirely captured in a dictionary. For all the playing with form that you do, the story has a very satisfying ending in that the “villainess” gets a comeuppance. It’s interesting what people take away. Some people think that Belinda doesn’t die because Chintana forgives her and the forgiveness holds her together. It’s a hieroglyphic. I’m extremely pleased that most people when they read it feel like they get it. Usually they read some of House of Leaves or Only Revolutions and go, “What the hell? !” For me, I like the fact that there’s this shimmering between what did or didn’t happen yet people feel conclusively they can come to the end of the hermeneutics of the book. Tell me the story of this book from its Dutch edition in 2005 to its current incarnation as both a standard hardcover and a deluxe edition in a box with Nepalese binding. I began to explore with them how to do it. I told them about the color quotation marks and they were excited. They felt it needed some sort of illustration. I was very open to that. My neighbor [Peter van Sambeek] became the artist for the Dutch edition. They printed 1,000 copies in English and some number in Dutch. Then they did a second run of another 1,000 copies. People kept asking, “How can we read this?” Only Revolutions was heading toward stores. Everyone felt like they wanted another design. I started looking at various graphic novelists and that didn’t work out. One actually took the money and ran. It was really disheartening. But I’m really grateful about what actually evolved. I’ve always wanted to do a reading through the five voices and over the course of doing that two times, I began to hear how they all moved together. For me it was a refinement and a chance to work through something. I had the opportunity to get into the clockwork of the story and learn something for myself. On top of that, it became more and more oblivious to me that thread was the element that had to be used for the illustration. I was over at my girlfriend’s place. She didn’t have any clothes in her closet. She just had a sewing machine. I grabbed a piece of paper and said, “Can I sew this?” And she said, “No, don’t touch that.” Of course when I did, I tore the paper and there were holes in it. The energy of that was very interesting to me. Once I had that idea, I assembled a little team to do all the sewing. I presented Claire Kohne with the idea. She had never really sewed, but the idea was not to get a highly qualified seamstress. It was more about the orphans and approaching these ideas in a childlike way. We sewed on pages that were too small; the resolution wasn’t right and the thread was too big. So we sewed on bigger sheets of paper, then we scanned them at a reduction that gave them the quality I wanted. We really attempted to avoid Photoshop, though there was some digital stitching. Pantheon was expecting a 144-page book with 12 illustrations. They got a 288-page book with over 80 illustrations in full color. They loved it. Then I had this idea to stitch the cover, but that was too expensive. We thought: What about doing the opposite, cutting off the spine and revealing the thread? Then we realized people [might think] it was damaged, and Amazon would pull it. We thought: What about doing a box? [Pantheon art director] Peter Mendelsund was already off and running. Pantheon decided to release two versions — a regular hardcover book and a deluxe edition that comes in a box with five latches, black ribbon, and Nepalese binding. You’ve performed this twice before on Halloween at REDCAT. This is the last year you’re doing it. Why? And what are you doing differently this year? 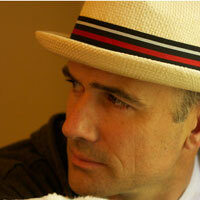 This year, the main focus is pianist Christopher O’Riley. He has composed music and will be playing it with me in five cities. REDCAT is the end of that process. This year, it’s about the voices and the music. Why do you think your work inspires such weirdly and intensely devoted fans? [long pause] I really don’t know. I know the answer I would like to hear: Writing those books took a great deal of devotion, so it would make sense that people who value that kind of commitment and are equally devoted to their enterprises would be drawn to something that required a great deal of devotion.